ADT is well known for its security solutions. Established in 1874, this brand brings a wealth of experience and reliability to the world of home security. A market leader in its field, ADT currently services both homes and small businesses worldwide and employs over 18,000 professionals. With an unbeatable reputation in home security, ADT has been verified by BBB (Better Business Bureau) since 2013, and their latest check meets BBB accreditation standards. This is based on business operation length, complaint volume, complaint response, and if the complaint was resolved. To get a quote for your home, you need to contact ADT by phone or by filling out a simple online form. This is so they can connect you to one of their local dealers. If you’re a home security novice, no need to worry, as ADT offers a customized solution based on your needs and budget. In addition, you can request a free home security consultation to help you decide on the best option for you. There are three packages available: Traditional, Control, and Video. All packages come with the standard equipment, with optional extras available to tailor your system to your specific needs. The Traditional package can start at $28.99/month for a 36-month monitoring contract and comes with ADT Go Family locator app, cellular connection, fire, carbon monoxide & flood monitoring, 24/7 monitoring, and a generous 6-month money-back guarantee. The Control plan includes everything from the Traditional plan plus remote arm/disarm via mobile app, email & text alerts, and home automation. The Video plan, at $49.99/month, includes everything from the Control plan plus remote secure video capabilities. The video plan includes a $49 installation charge after a $350 rebate and installation of one indoor wireless camera at no charge. This price does not include the $25 activation fee and requires a 36-month monitoring contract. All packages require professional installation, which means each customer has to arrange for a certified technician to come to the home and professionally install the system. DIY installation is simply not an option. There is also a one-time $25 activation fee for most systems. If you fall victim to theft, ADT offers a Theft Protection Guarantee which has you covered for up to $500 of your insurance deductible, providing your ADT system was armed. ADT also offers a Mover’s Security Guarantee which means they provide you with new equipment for your new home. This is great if you’re a renter, or if you think there’s a chance you’ll move during the contract period. You get a comparable package at no extra expense, as long as you’ve been an ADT customer for at least 2 years. You can also enjoy a 25% discount on any new security equipment that you might require. One point that’s worth mentioning is that ADT charges for an extended warranty whereas most home security providers offer at least a few years, if not a lifetime equipment warranty for free. ADT’s technology ensures each customer can thoroughly monitor their home. The advanced technology allows monitoring of temperature, flood, fire and smoke, carbon monoxide, burglary, and medical alert monitoring. ADT provides 24/7 professional monitoring to all of their customers through their own monitoring centers spread across the United States and Canada. If an alarm is triggered, the ADT team will immediately pick up the alert and contact the homeowner and also send emergency dispatch if needed. As a customer, you get full control over the monitoring of your property, with notifications sent via mobile phone. Indeed, ADT Pulse apps are among the best in the business, allowing you to control every aspect of your home security systems from your phone or tablet. 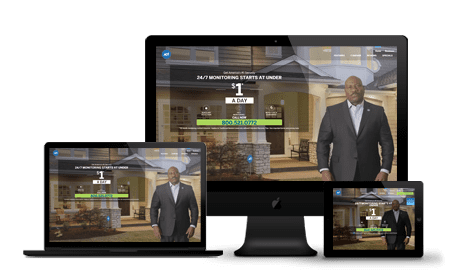 Communication between the ADT monitoring centers and the homeowner is delivered through the two-way security panel communication system, the smart voice sounder, and the motion detection which sends alerts directly to the homeowner. The equipment ADT provides is reliable and simple to use, with the hardware for a basic plan including a control panel, door sensors, and window sensors. Home automation options are easy to set up, and you can control pretty much anything remotely using ADT’s Pulse app. ADT’s searchable online help center contains all the information you might need regarding your system, including online manuals and guides. The support team is contactable by phone 24 hours per day, with email support also available for less pressing issues. ADT offers 24/7 phone and email support. Customer Service is available over the phone. You can also email them online to request a call back. Each topic on the help page has a video tutorial. Each topic on the help page has its own FAQ section. When you choose an ADT-monitored home security system, you’re getting comprehensive security monitoring from one of the most established companies in the industry. With a six-month money-back guarantee and one of the best reputations in the industry, ADT systems can do more than just home security – including protecting against environmental damage and home automation to ensure energy savings. You may find that an ADT system is a bit rough on the wallet, but its equipment is designed to meet the needs of every homeowner, and you get the peace of mind that comes with working with one of the most established names in home security. It’s worth noting that the equipment is not provided by or manufactured at ADT, they only monitor the equipment after it’s installed.